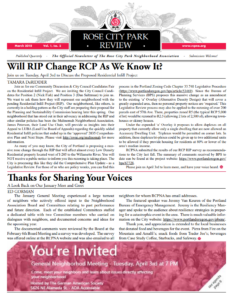 Some readers have interpreted the mention, in the front page article of the most recent newsletter, of the names of the current City Commissioners (Nick Fish, Position 2; and Dan Saltzman, Position 3) who are holders of the positions up for election on May 15th to inform that Mr. Fish and Mr. Saltzman will be speaking at the RCPNA Candidates Fair event. Commissioner Saltzman is retiring and was never considered to participate. Commissioner Fish has a conflict requiring him to participate in a City budget meeting at that same time. He will be sending a representative in his place.